Are you on the hunt for adventure? Are you looking for a versatile, power-packed and trail-rated SUV that will amp up your weekends? Look no further than the 2018 Toyota 4Runner at Downeast Toyota. Tailor-made for mud-slingin' adventures that take the road less traveled, the Toyota 4Runner is a fan favorite. If you have come to love the rugged design of the Toyota 4Runner and find yourself torn on which trim to choose, this 2018 Toyota 4Runner SR5 vs 2018 Toyota 4Runner TRD Off-Road vs 2018 Toyota 4Runner Limited trim level comparison may point you in the right direction. New 2018 Toyota 4Runner models are available in six trail-ready trim levels – SR5, SR5 Premium, TRD Off-Road, TRD Off-Road Premium, Limited and the performance-tuned TRD Pro – that can be tailored to fit your lifestyle. 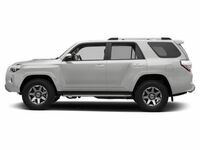 A key asset of the Toyota 4Runner design is versatility, with two- and three-row variants that will make room for up to seven passengers with the available third-row seats – optional for SR5 and Limited trim levels. An impressive 47.2 cubic feet of cargo space behind the second row makes the Toyota 4Runner perfect for weekend camping trips. What Are the Differences Between Toyota 4Runner Trim Levels? Reliable and powerful performance is a highlight of the rugged, body-on-frame Toyota 4Runner design that is put on display in this 2018 Toyota 4Runner SR5 vs 2018 Toyota 4Runner TRD Off-Road vs 2018 Toyota 4Runner Limited trim level comparison. A tried and true 270-horsepower 4.0-liter V-6 engine sets the bar high for the Toyota 4Runner and will earn 22 mpg on the highway with a five-speed automatic transmission. When properly equipped, the Toyota 4Runner will tow up to 5,000 pounds of cargo. Versatile Toyota 4Runner SR5 and Limited variants are available in rear-wheel drive or four-wheel drive – the rest of the Toyota 4Runner lineup comes standard with a part-time 4WDemand 4WD system with Active Traction Control. To upgrade performance on the trail, the Toyota 4Runner will add an Automatic Limited-Slip Differential, a Toyota Crawl Control feature and a Toyota Multi-Terrain Select system with driver-selectable terrain modes. Inside the 2018 Toyota 4Runner cabin, you will discover a wealth of standard features that make the Toyota-brand SUV a fan favorite at any price. A 6.1-inch Toyota Entune™ touchscreen infotainment system with access to Bluetooth is standard and will add integrated navigation, Entune™ App Suite and a 15-speaker JBL sound system when you choose the luxurious 4Runner Limited. Highlights of the Toyota 4Runner SR5 spec sheet include a 6.1-inch touchscreen display, a rearview camera, front and rear skid plates, fog lights, a power liftgate and a 120-volt power outlet in the rear. Upgrades include 20-inch wheels, a power sunroof, premium leather interior, heated and cooled front seats and power running boards. Experience the thrill of getting behind the wheel of the trail-rated 2018 Toyota 4Runner today when you visit Downeast Toyota!